Congratulations to the 2011 East Side Sox! MH Equipment would like to congratulate the 2011 Des Moines East Side Sox! Over the past 5 years, the Sox have boasted a 166 win and 35 loss record placing them in first place at 19 tournaments including the 2009 Global World Series in Kansas City, Mo. 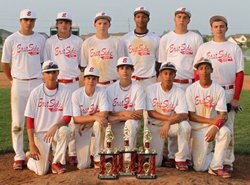 In 2011, the Sox finished 7th in the United States in Boys 14 & Under Major USSSA Baseball, 2nd in Iowa, and 3rd in the Midwest! Congratulations on an outstanding record and good luck in your future high school sports endeavors! 2012 Branch Events are in Full Swing! MH Equipment’s 2012 Branch Events are in full swing! We have recently completed events in Bowling Green, Dayton, Des Moines, and Lexington. At each of these events we showcased our MH Fleet Software as well as all of the great people of our branches! MH Equipment has the solution to your heavy duty industrial needs – without the commitment of purchasing a large piece of equipment! We currently have available in our rental fleet a Hyster® H550HD. The Hyster® H550HD offers best-in-class operator comfort; fast handling, reliable, proven components; and high productivity. If your operation needs a rugged, versatile lift truck, the Hyster H550HD is your performance solution –and it’s now available for rent! With a capacity of 55,000 lbs., these big truck models are ideally suited for a wide variety of applications such as steel manufacturing, and sea ports for general cargo or moving and stacking loaded and unloaded containers. It includes a sideshifting and fork positioning carriage and superior ergonomic features for greater productivity. With over 1500 lift trucks in our Rental Fleet, including several 36,000 lb. Big Trucks, we have the Equipment that’s YOURS WHEN YOU NEED IT! POWERTRAIN: Cummins Diesel QSC 8.3L Tier 3; 6 Cylinder creates 260hp @ 2000 rpm and 830 ft-lbs. of torque. MAST: 2 Stage 124? Max Fork Ht / 139” Lowered / 199? Ext Ht. CARRIAGE: 122? Wide Pin Type Apron Style SideShift with Fork Positioner- Carriage includes an apron side shifter allowing the outer carriage apron to move with the load as it is being side shifted. Also included in this carriage in an individual hydraulically adjustable fork positioner allowing the operator to control fork spacing while in the comfort of the cab. OPERATOR COMPARTMENT: Enclosed Cabin with Air Conditioning, Sunshades, and Deluxe Air Suspension Seat. Developed in 1990, Rail King supports railcar switching operations throughout North America. Engineered to maximize efficiency, safety and operator comfort, Rail King has been produced in five technologically improved generations including the next generation Rail King – the G5. As in previous generations of Rail King Models, G5 series have independent road wheels and rail wheels for quick, easy mobility on both rail and roadways; an enclosed, insulated cab with unsurpassed visibility for operator safety and efficiency, and a center console with easy view digital panel. In our full-width cab models that feature two independent operator control stations, left and right. MH Equipment is your authorized Rail King railcar mover dealer in all or parts of the Midwestern states of: Illinois, Indiana, Iowa, Missouri, Nebraska, North Dakota, Ohio, Pennsylvania, Kansas, Kentucky, South Dakota, and West Virginia. With 24 branch locations throughout these states, we have the manpower and services to take care of all of your railcar mover needs. So when it comes time for a new or used railcar mover at your facility, call MH Equipment and our experienced personnel will conduct a track survey to determine which model railcar mover fits your needs. In 2011 MH Equipment started a friendly competition between our branches to see who could collect the most non-perishable food items to their choice of local food pantries. Our Battle of the Branches to Benefit Community Food Banks is now over and the winner of the coveted “Battle of the Branches” trophy for 2012 is Scott City who collected an astounding 209.7 items per employee! We would also like to congratulate the Lexington branch for an amazing 2nd Place finish with 203.5 items collected per employee! Lexington was the winner last year and came very close to a repeat performance in 2012. Since the results for Scott City and Lexington were so close, The His First Foundation will be giving an $500.00 to the food pantries of their choice along with a pizza party for both branches. In 2011, which was our first year, we collected 12,381 items company-wide to donate to our local food banks. This year we collected 24,359 items – a 97% increase over last year! AMAZING! It’s incredible to see how much of an impact we can have when we work together as a team. We would like to thank all of the great people at MH Equipment for having the passion to serve your community! On May 17th 2012, MH Equipment’s Des Moines branch had the honor of hosting the Industrial Truck Association’s (ITA) OSHA Alliance Presentation entitled – “Forklift Safety: Operator, Machine, and Environment.” The presentation was an overview of standard forklift safety, operation, mechanical, and regulation information for Occupational Safety and Health Administration (OSHA) Inspectors in Iowa. In attendance were approximately thirty OSHA personnel, as well as numerous MH Safety and Training personnel. The meeting was a success, proving to be an enjoyable and educational experience for all. The ITA Presenters, Bill DeVries and Mike Frasier, did an exceptional job presenting the materials and answering questions from the attendees. From a personal standpoint, I thought it was interesting to learn how the Regulatory and the Industrial Truck Standards Development Foundation (ITSDF) affects the development of standards for the American National Standards Institute (ANSI) and OSHA. It was also interesting to learn the different manufacturers’ positions on meeting these standards and on lift truck modifications. The explanations regarding training, evaluation, retraining, and reevaluation were very informative as well. Seeing the Bureau of Labor’s data showing that almost 20,000 forklift accidents in 1995 dropped to less than 9,000 accidents in 2009 really drove home the benefits of operator training. On a final note, I was thrilled with the opportunity to be a guest presenter for the ITA. With the large number of OSHA personnel in attendance, the ITA representatives asked if I would be willing to help with the product overview and inspection presentations. I had the honor of presenting the Class I counterbalanced electric product information to the group. The OSHA personnel had great questions and showed an exceptional knowledge of the equipment. How Well Do You Know Forklift Safety? What is Your Forklift Fleet Costing You? When it comes to optimizing and managing your fleet assets, the more information you have the better. And the better the information, the more effectively and efficiently you can improve your facility’s operating environment. Therefore, with optimal fleet solutions, you can reduce unnecessary capital expenditures. A fleet management program typically includes reviewing your current material handling fleet to determine current expenses, analyzing those expenses and looking for opportunities for potential cost savings, reviewing recommendations for maintenance and/or replacement of equipment as well as training and financing options, implementing selected recommendations, and finally monitoring and reporting fleet progress to ensure that your fleet remains in optimal condition. Having a fleet management program in place can help you increase productivity, improve asset utilization, and improve operator safety and accountability, all using intuitive web-based reporting. You Down with PPE? Yeah.. You Know Me! Hyster Company recently honored its top-performing dealers with its prestigious Dealer of Distinction award. The 2011 award-winning celebration, held on Kiawah Island, S.C., marked the 18th year that Hyster has honored its dealers for their industry-leading level of performance in all areas of the materials handling business. “Hyster Company’s Dealer of Distinction Awards Program recognizes dealers with focused leadership who have driven their companies to the highest level of performance in all areas of the business,” said Jonathan Dawley, president of Hyster Distribution. “The dealers that make this commitment to strive for distinction elevate their organization to this elite level.”To become a Dealer of Distinction, dealers must reach elevated goals in customer satisfaction, dealer performance, general management, truck sales, short-term rental, training, aftermarket sales, and parts and service operations. Arnold Machinery’s Colorado Division was named a Dealer of Merit. The Motrec T-210 standup tow tractor is powered by an 8 hp 24 volt motor and can tow a 10,000 lb. load. It will accept a 24 volt industrial battery and travels at speeds up to 6 mph un-laden. The T-210 has been designed for applications that require frequent stops. Large wheels provide a smooth ride and an ergonomically positioned steering wheel contribute to operator comfort. Well suited for congested industrial settings, the Motrec T-210’s standup operator position makes it convenient to frequently mount and dismount while providing excellent visibility to the operator. If you answered ‘Yes’ and are looking for a position where you can grow and develop in an atmosphere where People Matter, Passion Inspires, and Purpose Unites, then MH Equipment is the company for you! When you join MH Equipment, you’ll be joining one of the leading material handling dealerships in the country and one of the largest in the Midwest. We have 26 locations in 10 states and over 600 hardworking and dedicated employees. We are always searching for the best talent to join our team! Your hard work and dedication will be rewarded with a competitive salary and benefits package and a positive work environment. The New Rail King is Here! It was quite an exciting morning at our Des Moines Branch yesterday! A new Rail King RK320 arrived at our dock doors in all of its bright orange glory! If you’d like to see this amazing piece of machinery in person just stop by our facility or contact MH Equipment for more information! This piece of equipment is located in our Cincinnati, OH branch. Visit our Used Equipment website for more information. This piece of equipment is located in our St. Louis, MO branch. Visit our Used Equipment website for more information.